As you move along the Search path, you may feel the sense of autonomy and independence that motivated your quest to run your own business. However, you are still accountable for your activities, decisions and directions – whether your funders are backing your search or you are funding it yourself. Regularly spaced reporting is a great discipline to develop early on in your search. There is value in periodically reflecting on your progress, re-establishing goals and integrating market and personal learning. Having a “regularly scheduled” time to do this can revitalize your search, keep your supporters engaged, and establish a reporting rhythm that will be valuable for the company you eventually purchase. Consistency and frequency build trust. Your audience should be potential investors in a funded search, formal and informal advisors, parents, your significant other and key members of your network who are interested in your progress. They are “living your dream” vicariously along with you and want to know where you are in the search process. For self-funded searchers, quarterly reporting to potential investors runs a high risk of fatigue. Most won’t understand the challenges of the search and may lose confidence in your ability as you constantly report on your disappointing results from quarter to quarter. Funded search investors, on the other hand, know what to expect. Spend no more than about 3-4 hours on your report. Publish a maximum of a page and a half in length so your update is not shuttled to the bottom of an email inbox. Avoid the friction of opening a separate attachment, so include your update in the body of the email. Strive for short sentences and paragraphs for brevity. Before writing your first update, reach out to a seasoned searcher in order to see how he or she effectively communicates. As you are searching, it is easy to get caught up in the day-to-day activities and lose sight of your own progress. Tracking and reporting your progress with data and commentary is part of the learning process. Show your activity with metrics that help portray a sense of progress over time. Put them into a linked spreadsheet that will show quarterly data over the search period to highlight trends in activity. Compare your historical trends with that quarter’s goals and use actual results to create the next quarter’s goals. Include your prospecting activity that enumerates your “search pipeline”, keeping your proprietary search efforts separate from brokered, but with totals for both methods of sourcing. Consider tracking details like prospects identified, communications sent, responses, positive engagements, NDA’s submitted, face-to-face seller contacts, seller phone calls, site visits, IOI’s made, LOI’s issued, expenditures, burn-rate and months to flame-out. Also, specifically identifying disqualified opportunities to show that the you understand the pipeline process with discrete its gates. This data can support your written commentary as you observe trends, patterns and reasons for changes in activity. Identifying the most interesting deals, perhaps just 3 or so during the quarter will provide a sense of what has been in your pipeline with brief a brief overview of revenue, EBITDA, employee count, market, and seller profile. Highlighting the reasons that these top prospects were attractive reinforces your focus on the “ideal seller profile” and your assessment of their potential to close. Also discuss the businesses that have gone away, and why. Reflecting on the ones that got away will make your next approach that much more effective. Another section should cover the progress on your goals from the last report and your projected plans for the upcoming quarter. Leverage your progress last quarter to shape next quarter’s goals. Identifying your progress with interns if you use them will help keep them engaged. A final section should cover the emotional side of your search with reflection on your own surprises, learning experiences and disappointments. Again, your audience wants to gain a sense of what it is like as you travel along this path. Your feelings along the way especially compared to your expectations. Remember – this is understood to be a process – don’t appear “head over heels” in love with only one prospect and then appear crestfallen when they fall away. Taking the opportunity to reflect on what is working, and more importantly, what is not working, is one of the most positive benefits of regular reporting. Focusing on what you will be doing different is the basis for continuous improvement. Since time is such a precious commodity in your search phase, you cannot afford to spend time in areas that are not driving you to close an acquisition. Looking back beyond the last quarter also gives you an opportunity to reflect on your overall progress, after all, this process is a huge learning experience which becomes even more apparent after you have been at it for a while. Elicit help from your interns and/or partner to do this. A mini-360 review can be institutionalized along with this regular reporting. Challenging each other to “change” or modify practices will help root out inefficiencies. A quarterly report- will be great “practice” for you as you prepare to run the business you purchase. Getting in the habit now can help clarify your thinking and encourage/engage your current or potential investors, as well as broader network. Regular communications with employees, lenders, investors, vendors and customers all build trust in your ability to lead the business to sustainable profitability and growth. If anyone would like to an anonymized version of “Inman Square Capital Q1 2011 Report,” etc. Let me know. It definitely helped me search and Jim worked with me early on to set it up! Jim – any reason you would advise for or against monthly reports? Perhaps this is something that is done by the searcher for internal purposes (but not distributed), and then subsequently used to compile a quarterly report? In my current role, I provide a monthly update to the Board and find it incredibly helpful given how fast things can move and change month to month. The trade off is the administrative burden and time it takes to do on a monthly basis. Kareem, nice question about Monthly or Quarterly. During my own corporate days, I quickly discovered that if I put in an “Easter Egg” to see if anyone was reading by the 5th page, indeed monthly seemed to be too often. However, in my involvement with a high-tech startup the founder uses the monthly format. Since time is the most precious commodity for a searcher, 90 days seems to me like a good tradeoff. After purchase, most searchers have quarterly board meetings accompanied by more extensive reporting, so this is good practice! Search on! I’d stick industry ideas fairly near the top. Generally when reading them, it is nice to be able to reply with some sort of help (oh talk to x, y or z). Industry can be helpful for that. I’d also recommend to sending it to people you’ve asked for advice along the way. Many people spent years searching….and want to help. It’s that belief that industry ideas and search metrics are ‘edge’ or ‘secret’ that seems to keep wider distribution happening. Just ask the littany of unsuccessful searchers who kept all their industry ideas secret how well that worked! 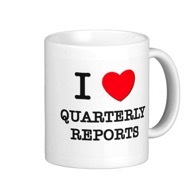 Minor point, but does it really matter if it is ‘quarterly’? I sent one out in early September with no regard to the quarterly calendar of Wall Street A. because I’m not trying to kid myself I’m like them and B. I just happened to actually find time that weekend to sit down and write it. I assume sending something like this out when the whole world is writing quarterly reports is just likely to increase the chances of it being ignored? Also I hear your point about not waiting 3-4 days for that next piece of news. Assume this is because there is always a piece of news every 3-4 days and that line of thinking would lead to perpetual delays. On the other hand I assume nobody is sitting there thinking “ooh, Adam sent that a day later in the month than last time, he must be disorganized”. I definitely agree that reporting is key for a searcher. I would add that you should not expect to receive many direct responses from the addresses. Actually, I was a bit disappointed the first time I sent my report, but talking with other searchers, I realized afterwards that it was quite normal. However, you should not underestimate the impact of your reports on the people you send them to. People will for example forward your emails to relevant people they know and you will be able to build powerful new connections. Personally I could connect with very savvy investors and business people.